From tomorrow Indians will need to pay more for any kind of services they pay for which includes eating out, traveling, internet services, mobile bills among others. The Krishi Kalyan Cess of 0.5 percent proposed by Finance Minister Arun Jaitley during Budget 2016 will be applicable to all from tomorrow i.e. June 1st! Prior to this, the service tax rate was 14.5 percent, which included 0.5 percent Education cess. This incidentally is the third time Service tax has been raised in last one year. 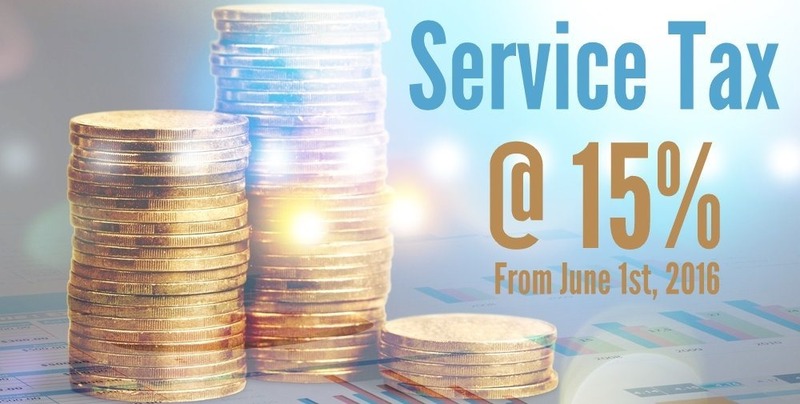 Earlier, the Service Tax was 12.36 percent which was raised to 14 percent and became applicable from June 15th 2015. Then, from June 1st, Education Cess was of 0.5 percent was added making it 14.5 percent. This cess has been levied specifically for financing initiatives related to agriculture and welfare of Indian farmers. The amount generated from the Krishi Kalyan Cess will not be used for any other purposes. With GST (Goods & Service Tax) expected to get passed in this Monsoon session, this again might just for a short duration of time. GST is expected to have a rate of 17%-18% and it will replace all other forms of tax and will be uniformly levied across the country! 3 Service Tax Basics You Should Know! 1.) No Separate Act: Service tax has no separate act, it is originally levied from finance Act, 1994 and parliament has used the entry no. 97 from Union list to provide support of Constitution of India to levy this act. 2.) Basic Taxability: Before to proceed for anything, one must understand that service tax will only apply on services provided. It cannot be applied on goods. Hence, if you are selling goods and not services, then you are not under the ambit of this tax. 3.) Understand the mechanism: Even if you are a service provider, then also it doesn’t mean that you have to pay the service tax. Once, it is proved that we are providing services, and then we have to check the mechanism of Service and its rules. "New Effective Service Tax is 15% From June 1st, Thanks to Krishi Kalyan Cess", 3 out of 5 based on 8 ratings. Make the Tax 100% . Middle Class, Senior Citizens & Retired wont survive this Government.Take away from us and redistribute to the Minorities , Reserved and so called under privileged. Our leaders are only for vote bankers who dont work and take our hard earned money by doing nothing but complaining , not working and living of others money handed over in a platter. Take a look at the slums you will even find split Units and DTH connections some times even our hard working Middle class cant afford. Dont spoil our people let them work based on merit if they want to develop. Its a hard time for the Retired our savings are not enough RBI is consistently dropping the rates on savings even though the price of all basic commodities & food is on the rise.